and 379 people were injured. In 2016, a total of 142 failed, foiled and completed attacks were reported. and most of the casualties were the result of jihadist terrorist attacks. 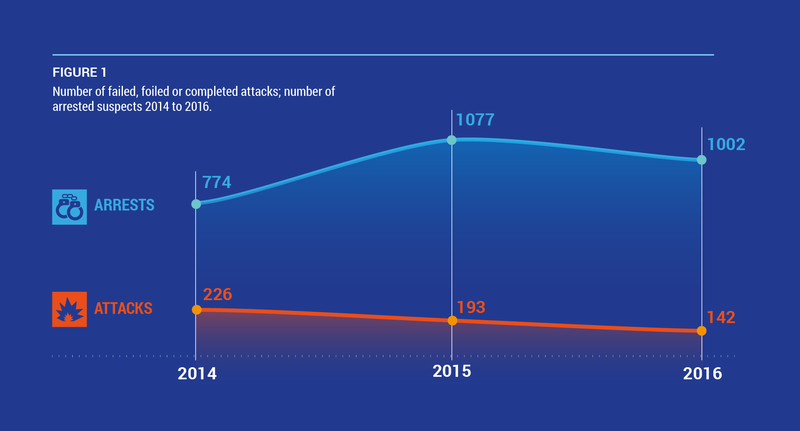 The total number of 142 attacks is a continuation of a downward trend that started in 2014 when there were 226 attacks, followed by 211 in 2015. The largest number of attacks in which the terrorist affiliation could be identified were carried out by ethno-nationalist and separatist extremists (99). Attacks carried out by left-wing violent extremists have been on the rise since 2014; they reached a total of 27 in 2016, of which most (16) were reported by Italy. The number of jihadist terrorist attacks decreased from 17 in 2015 to 13 in 2016, of which 6 were linked to the so-called Islamic State (IS). However, a precise ranking amongst and within terrorist affiliations across the EU cannot be established because the UK does not provide disaggregated data on attacks. All attacks reported by the UK were acts of Northern Irish-related terrorism and involved 49 shooting incidents and 27 bombing incidents. Of these, four involved attacks on National Security Targets. The exceptions are six victims of paramilitary violence in Northern Ireland and the murder of a UK Member of Parliament by what was reported as a domestic violent extremist. Explosives were used in 40% of the attacks, with similar numbers to 2015. The use of firearms dropped considerably from 57 in 2015 to 6 in 2016.
and are therefore not included in the numbers of terrorist attacks being reported by Member States, with only one exception in 2016, reported by the Netherlands. The number of arrests for terrorist offences in 2016 (1002) is lower than that of 2015 (1077). Most arrests were related to jihadist terrorism, for which the numbers rose for the third consecutive year: 395 in 2014, 687 in 2015 and 718 in 2016. Numbers of arrests for left-wing and separatist terrorist offences dropped to half of what they were in 2015 (from 67 and 168 in 2015 to 31 and 84 in 2016 respectively). Numbers of arrests for rightwing terrorism remained low at 12 in 2016 compared to 11 in 2015. 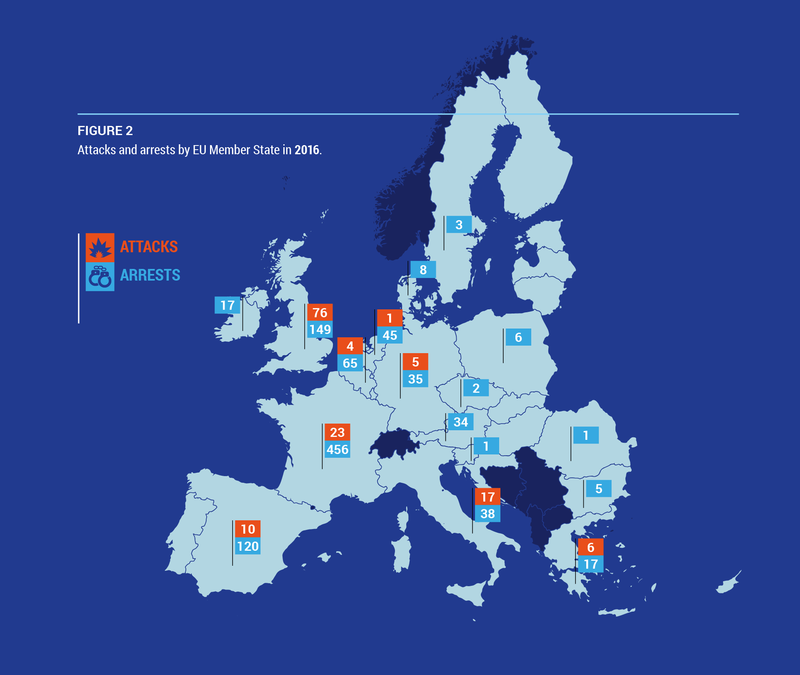 France is the only Member State in which the overall numbers of arrests continue to increase: from 238 in 2014, to 424 in 2015 and to 456 in 2016. Almost one-third of arrestees (291) were 25 years old or younger. Only one in ten arrestees (9%) in 2016 was older than 40 years. Arrests for terrorist activities (preparing, financing, assisting, attempting or executing attacks) decreased from 209 in 2015 to 169 in 2016. Arrests for travelling to conflict zones for terrorist purposes also decreased: from 141 in 2015 to 77 in 2016. This was similar to the decrease in numbers of arrests of people returning from the conflict zones in Syria and Iraq: from 41 in 2015 to 22 in 2016. An average of nearly 10 attacks a day were carried out on refugees in Germany in 2016, according to Germany’s Interior Ministry, as reported in open source media. Please see the definition of terrorist attacks, included in the Annex on Methodology.